Love this fireplace. Where did you purchase it? Thats great to hear because this is what I would like in my living room. Hi,, you never answered the questions regarding the tiles. What is the resource for this fireplace? How would one go about framing an existing gas fireplace like this. Is there anyone that manufactures just the frame and possibly glass doors for it? @prospera, there are somethings you can do to update an existing fireplace, but you have to make sure you don't do anything that will create a possible fire hazard. We have fabricated a stainless steel surround for another project that I think came out looking very nice (see below). 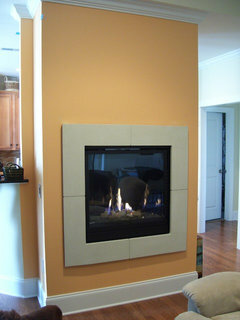 We have also custom built a surround using non-combustible cement board (second photo). Do you have a photo that you can post in a new discussion? The make and model of the existing gas fireplace would be very helpful as well, because I can look up the clearances and requirements of that particular model if I have that information. Tile around fireplace ???? and make of the fireplace ??? Lamp - I love this lamp. Would you recall we're it's from? Thanks in advance. Fireplace surround - Is that stainless steel surrounding the fireplace? Worried that the heat from the fireplace wil affect the Tv! - I have always thought of this with reservations due to the above concern. What is the fireplace wall faced with? Is it tile. And if so what kind of tile. Is the fireplace gas or electric? How is this fireplace fueled? Vented? Need a chimney? what color tile is this? How is this 'extra' wall secured? The TV and hanging fireplace would need some sort of support...we are building a new house & would love to do this in our master. Already have the components, but can't determine how this wall is affixed to floor & ceiling. 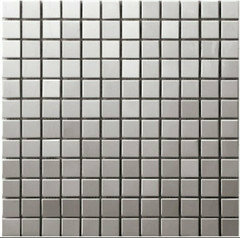 Are these tiles mirror mosasic tiles? Where's the vable box? 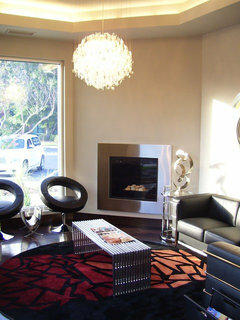 - Where is the cable or satellite box hidden when mounting a tv above the fire place like this? This house uses a control 4 system so all of the componenets are housed in a utility room in the basement. Alternately I would have used a small cabinet to house the cable box etc. What are your thoughts here? Ive been considering this secondary wall unit in my apt because the walls are metal framed so not weight bearing to hold such products w/o tearing up drywall to add 2x4s first. Just havent concluded on how to anchor to existing wall. Familiar w/ sliding door/rod design (as project/contract administrator, this was used in a high profile condo unit we constructed behind Tysons Corner II, VA). I am on the top lvl of my bldg so, even more structure concerns if anchoring to ceiling. I love the chair/chaise! Can you tell me the manufactuer? Thanks. Please give me the vendor and item # of the fabric on chair and ottoman? Beautiful fireplace! would really like to recreate this in our living room. This looks like free standing wall. Can you tell me how you constructed it and how far away from the main wall it is? Also, what is there to keep it from falling? where can I find tyhis firplace and wall titles? Valspar's Light Raffia is a similar color. I think it's the silver. It's from Stone Tile International. where did you get these beautiful drapes? Chair - What manufacturer is chair & fabric color please? Fireplace - Can any glass tile be used around a fireplace ? I love the fabric and style of the chaise/chair! What is the name? Fireplace tile - Is the tile in a natural or sand finish? Love the fireplace - You can find that kind of fireplace and also wall mosaic on www.edezeen.com at very good prices and good suppliers. Love the chair. Where can I purchase one? What is the fabric on the chair? Beautiful. No mantle - Is the tv safe from heat without a mantle? Pillow ? - Where did you purchase that fabulous pillow? Where can I buy the vetro silver lux? Is there a store in Colorado? will crema marfil split tiles discolor or split if put behind the Horizon fireplace? 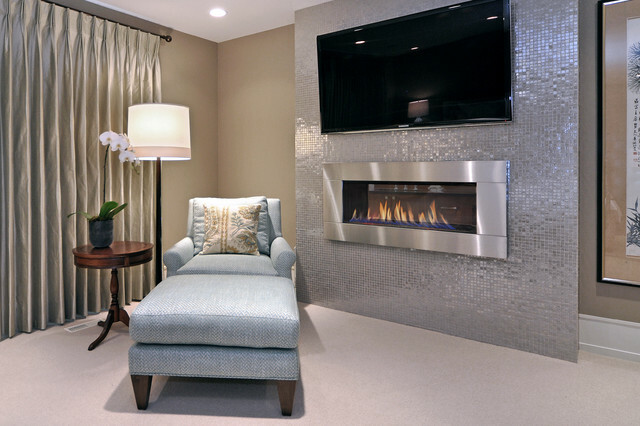 Fireplaces in the bedroom should also come equipped with seating. Turn on a holiday movie for the kids and escape to this spot for a much-deserved break.